The email seemed too preposterous to be taken seriously when it arrived in Mark Cisco's inbox last spring. A man unfamiliar to the Columbia University basketball player contacted him to see if he'd be interested in pursuing a pro career in a sport he had neither played nor watched before. The message promised the Australian Football League would fly Cisco to Los Angeles and pay for his hotel room for three nights if the 6-foot-9 senior agreed to participate in a two-day tryout in Redondo Beach beginning April 14. "At first I wasn't going to do it, but eventually I thought I might as well go if somebody is going to pay for me to fly out to LA," Cisco said. "I get to try a new sport and meet some new people. Why not? I had nothing better to do. It was a good excuse to miss some class, so I just kind of went with it." The 16 soon-to-graduate Division I basketball players who joined Cisco in Los Angeles included a starter at Illinois, an all-conference forward at Appalachian State and a future NFL prospect from Wisconsin-Milwaukee, but none found the transition to Australian football easy during the two-day combine. They struggled with even the most basic skills, shanking kicks, botching catches and laboring just to control the oddly shaped ball. "You'd see guys who were great athletes trying to dribble a ball and it was going everywhere," Cisco said. "It was funny to watch but then again you couldn't laugh too much at the guy in front of you because you'd go out and do the same thing." If it seems fruitless for the AFL to sink thousands of dollars into an annual tryout for players completely unfamiliar with the sport, league officials would politely disagree. Executives from six AFL teams flew 16 hours to attend the combine because they view the recruitment of U.S. college basketball players as a potential solution to the league's most glaring talent shortage. In 2011, ex-Bethune Cookman forward Alex Starling received a two-year, $180,000 contract offer from the Sydney Swans after a tryout in Los Angeles, but he hasn't panned out as a result of a lingering stress fracture in one of his legs. 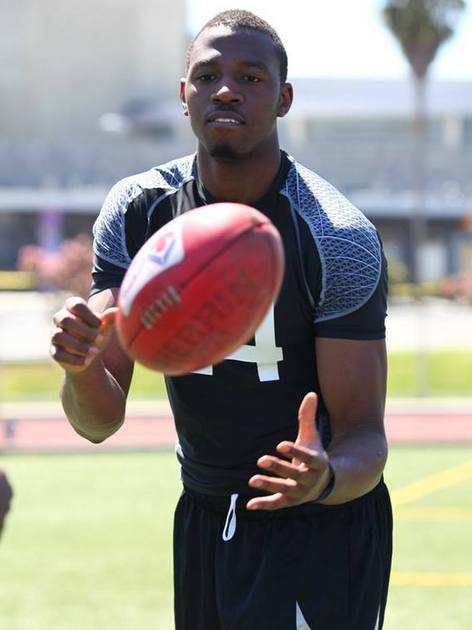 In 2012, former Seattle University and DePaul forward Eric Wallace dazzled AFL executives with his chiseled 6-foot-7 frame and impressive athleticism at the inaugural league-wide U.S. combine, earning a similar two-year, $180,000 deal from North Melbourne. 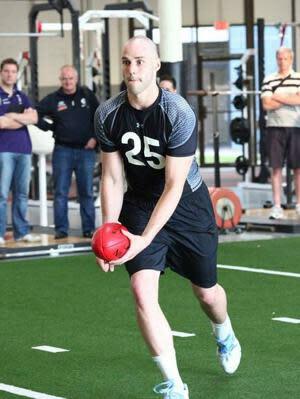 And last month, former North Dakota forward Patrick Mitchell received the same contract from the Sydney Swans after a strong showing at the same combine Cisco attended in April. "It's only a matter of time before an AFL club unearths a super talent in the U.S.," said Michael Ablett, the AFL's Academies Development Manager. "First and foremost, they are elite athletes. In Australia we are unfortunately unable to consistently provide enough athletes 200 centimeters and taller to fulfill the needs of 18 clubs. In 14 years of combine testing both at national and state levels, we have only tested 84 players that are 200 centimeters and taller, therefore highlighting our need to look outside the box. "There is absolutely no doubt that the [annual U.S. combine] is worth its weight in gold in terms of the financial commitment, as should you be able to develop a dominant player of that size, it certainly has the potential to have a profound impact on the result of a game." Ireland and the South Pacific have traditionally been the most fruitful sources of international talent for the AFL, but Ablett believes U.S. basketball players will soon be the league's most coveted imports. Whereas the idea was seen as "gimmicky" and "a bit of a long shot," as recently as a few years ago, the perception of many teams has changed due to the caliber of the athletes who have attended the first two U.S. combines in Los Angeles. The man responsible for identifying those athletes is hardly a newcomer to scouting basketball. Jonathan Givony, founder of the popular NBA draft-themed site DraftExpress.com, began consulting for the Sydney Swans in 2009 and has worked for the AFL identifying basketball players for its annual U.S. combine since the months leading up to the inaugural 2012 edition. Unfamiliar with Australian football prior to consulting for the Swans, Givony fell in love with the sport after attending the 2009 Grand Final played before more than 100,000 fans. The next couple seasons, he regularly stayed up until the wee hours of the morning watching AFL telecasts and combing YouTube for highlights, trying to gain a better understanding of the sport and the physical attributes good ruckmen or defenders possess. Each year, Givony makes a list of soon-to-graduate college basketball players 6-foot-6 or taller who are unlikely to play in the NBA or an elite European league but have enough rebounds, steals or dunks to suggest they're athletic enough to interest AFL teams. Givony then talks to people familiar with those players to get a feel for their character and watches footage of them via the scouting tool, Synergy, in order to verify they have skill set to succeed in the AFL. The players Givony targets may not understand the most basic rules of Australian football but their potential is obvious during combine testing. At the first U.S. combine alone in August 2012, six of the 25 players who attended eclipsed the previous Australian football record for vertical leap, which had been 30.7 inches. "They need guys who are athletic as hell, who are big and who are tough," Givony said. "It's a very physical sport and it's not for the faint of heart. There's a lot of soft guys who play basketball and get away with it. You really have to be a tough dude to play Australian football. So that really narrows down the field a lot. "The other thing is guys have to have a certain mental capacity as well. You're learning an entirely new sport and it's a very tactical sport. There's a lot of rules and training and on top of that Australians are very big on team camaraderie, character and the ability to work within a group. If you bring in an American guy who has never played the sport, you almost have to be of higher character because you have to be accepted into that group." 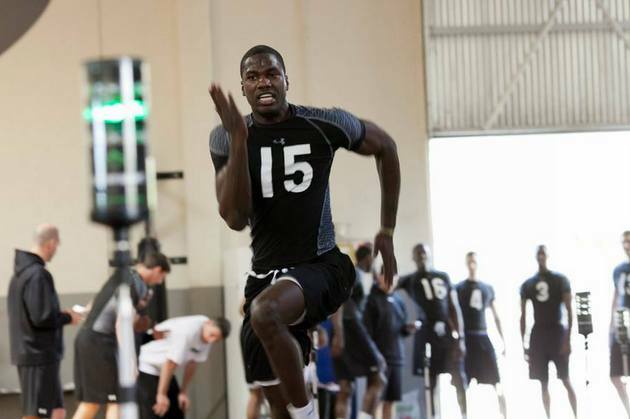 Of the roughly 200 to 250 college basketball players Givony invites to the AFL's U.S. combine each year, he estimates only about 10 percent agree to attend. Even those who do eventually participate are often initially baffled by why the AFL would be pursuing them. North Florida forward Matt Sauey had only caught a glimpse of Australian football once while scrolling through the channels late at night before Givony got in touch with him last summer. Appalachian State standout Nathan Healy had never even heard of the sport before receiving his combine invitation from Givony. And St. Francis (NY) forward Akeem Johnson didn't believe Givony's Facebook message was intended for him when it arrived in his inbox last spring. "I thought he contacted the wrong person," Johnson said. "I told him several times I never played football, I had no experience whatsoever and I wasn't too sure what the AFL was. He sent me a lot of YouTube links and a lot of links to other sites and convinced me to come to Los Angeles and try it out." Two of Givony's biggest success success stories so far are ex-basketball players who once had no more knowledge of Australian football than Sauey, Healy or Johnson did. Wallace, a decorated basketball recruit who received a scholarship offer from North Carolina as a high school sophomore, once dreamed of playing in the NBA before injuries and modest results at Ohio State, DePaul and Seattle University derailed that quest. He was smart enough to shift his focus to the AFL last year and could be promoted to the league's top division as soon as next spring after excelling for North Melbourne this year in his first season in the development league. Like Wallace, Mitchell had no opportunities to pursue pro basketball after an offer from a team in Portugal fell through and was just hoping to avoid working a 9-to-5 desk job before he received an invitation to April's AFL combine in Los Angeles. Had Mitchell not jumped at the chance to try a sport he barely knew existed prior to April, the Des Moines native says he'd probably be training to be a firefighter in his hometown right now. Instead the former North Dakota forward is working out by himself and practicing with a semipro Australian football team in Des Moines two days a week until he leaves for Sydney to join the Swans in October. "Every day I wake up, I still can't believe they offered me a contract and I'm actually going there," Mitchell said. "I went over there for a three-week tryout and I absolutely fell in love with the place. Another reason I'm so excited to play for them is they've shown a commitment to developing international players in the past. I think it's the best possible place I could be." As the two Americans closest to making the premiership in the AFL, Wallace and Mitchell have plenty of supporters back in the U.S. There's Givony, who knows his sales pitch to basketball players will only get easier if one of his recruits enjoys big-time success in Australian football and parlays that into a lucrative contract. There's other former basketball players, who have been passed over for AFL contracts thus far but are hopeful Wallace and Mitchell could pave the way for more opportunities. And there's officials at the fledgling United States Australian Football League, who are hopeful that more American players in the AFL could increase interest and media coverage for the sport in the U.S..
"This is a great opportunity for the game here," USAFL operations manager Doren James said. "College basketball players will have a built-in fan base of people who will be interested in following them as they pursue an AFL career. We're hoping to capitalize on that and create more awareness. The more we spread the word, the more we can grow the sport and maybe pique the interest of some younger athletes." One of the Americans with the best chance to help Wallace and Mitchell grow the sport in this country is Cisco, whose passion for Australian football has grown considerably since he almost turned down his invitation to the Los Angeles combine five months ago. What began as a mini-vacation to the West Coast turned into something more serious when Cisco received an invitation to come to Sydney and try out for the Swans along with Mitchell and former Morehead State forward Jason Holmes. The Swans chose to offer a contract to Mitchell rather than Cisco, but the ex-Columbia center showed enough promise to secure an invitation to the AFL's main pre-draft combine next month, where he will have a chance to prove he's worthy of a contract offer from another team. "When they told me I'd been chosen to go to Australia, that's when I started to take it more seriously," Cisco said. "I'm going to go over there in September, I'm going to do my best and I hope they like me. I've heard some of the coaches really like me, so I hope one of the teams is able to offer me a contract. If not, I'm going to have to come back here and either pursue basketball or get a real person job."